The effects of the federal government shutdown are tangible and far-reaching, from longer airport-security lines to complications with food-assistance benefits. They’ve even begun affecting what school cafeterias serve. The Vance County school district in North Carolina informed the public yesterday that it would be reducing school lunches to a “minimum level” to conserve funds and resources during the federal government shutdown. 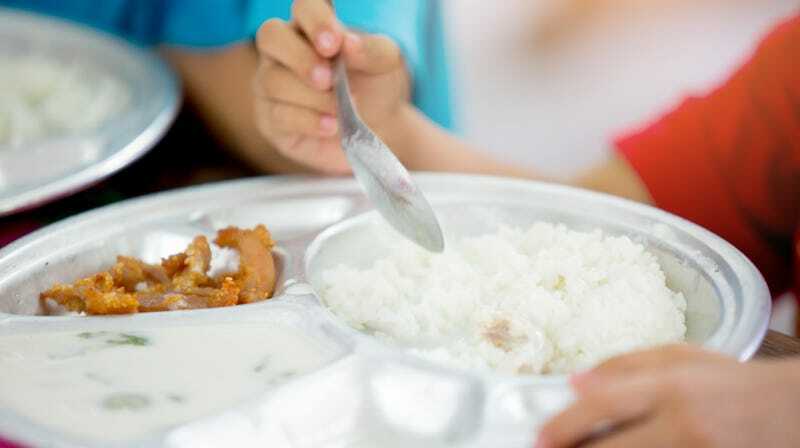 Minimum levels mean students will be served “one main dish, bread, two vegetables, one fruit, and milk,” but not bottled water, ice cream, or in some cases, fresh produce. The school district’s Facebook post explains that fresh produce will be eliminated entirely from menus, except at elementary schools included in the Fresh Fruit & Vegetable Program, which “will be decreased to two days each week.” Bottled water and ice cream will not be restocked once current supplies are depleted. The district says its nutrition program is supported by federal funds, and that it hopes to resume normal lunch service if and when the shutdown ends. The post has been shared more than 1,000 times and has more than 100 comments, some of which argue where to lay the political blame for the shutdown, while others argue whether the reduced lunch options are really so bad.